A Brief Guideline to Physical Activity for Youths - Energetic Juniors - Contact Us! We all know that exercise for our kids is important. The difficult thing to understand is how much exercise they need and what kind of exercise they need. Major research findings show that regular exercise reduces the risk of adverse health outcomes later in life and improves overall body composition. So how much ‘regular exercise’ do our kids need? We plan to clarify that for you here. We can effectively split youths into two primary groups when it comes to exercise recommendations: those under the age of 5, and those from the ages of 6 to 18. Let’s look at the younger group first. Children under the age of 5 who are able to walk unaided should be getting at least 3 hours of physical activity every day. This 3 hours may sound like a dauntingly great amount, but the activity quota for this age group can be spread throughout the day and can occur indoors or out. This 3 hours also includes light activity, which is activity of a lower intensity than moderate- or vigorous-intensity activity. Some examples of light activity include walking about, standing up, and less energetic play. In addition to light-intensity activity, this age group should also engage in some more energetic physical activity as part of its daily 3 hours of exercise. This includes active play, running around, skipping rope, gymnastics, etc. The second group of youths (those of the ages of 6-18) have a different set of guidelines. This group should do 60 or more minutes of moderate-intensity aerobic activity every day. (Wondering what counts as moderate-intensity physical activity? Click here for some examples.) As part of these 60 minutes of daily activity, vigorous-intensity activity should be included at least 3 days a week. (For examples of vigorous-intensity activity, click here.) This group should also do muscle-strengthening physical activity at least 3 days a week, and bone-strengthening physical activity 3 days a week—all of this included in the allotted 60 or more minutes of activity per day. Of course, if you need some guidance on which activities falls under muscle-strengthening physical activity and bone-strengthening physical activity, click on the terms above to see some guidelines. Children’s learning is affected by their environment. Children learn through physical experience, social interaction, and reflection; but remember, their learning styles differ, so pay close attention to your own child. Children learn through PLAY. This is the primary way a child learns a new skill. Children learn unhealthy behavior by watching adults. And of course, we at Energetic Juniors are always here to help. 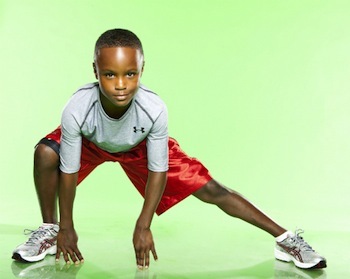 Our one-on-one coaching is a fantastic method to boost your child’s activity levels. For more information, give us a call at 212-879-1566, or email Bonita@EnergeticJuniors.com. Thanks for reading, and have an Energetic day!